Following the route of the seasons, I find myself deep into my late summer/early fall routine. I’ve canned a box of peaches, something I must do, or my Inner Squirrel is out of sorts. This is the time of year when the Douglas squirrels are feisty and busy, gathering cones for winter storage, nibbling on tasty mushrooms, getting the territory ready for a different season. I know the feeling so I put juicy ripe peaches in jars, just as I was taught by Mother and Grandmother Squirrels. Doesn’t matter if I’ve been sawing logs on the trail all day. Green beans, tomatoes, zucchinis, cucumbers and basil are also on my rodent radar. I’m looking at the nest with a critical eye, setting goals for projects I want to have done before the snow flies and time to move inside. Between bouts of frenzied food processing, I make time to dawdle around the garden. The bright sunlight pours over a tomato-colored zinnia, making it glow. The hot pink ones are nice too. I stand next to the ‘Kong’ sunflowers, rooted into the garden soil like pine trees. They are twelve feet tall, and I marvel that they are annuals which grow so high in a short season. The big heart-shaped leaves could be an umbrella. Mornings are cool, so the bees are a little slow to wake up. But when the sun hits the hive and the air warms, they go back and forth with their usual single-minded purpose. I see them in the sunflowers, rolling in pollen. Over at the ranger station, Smokey says the fire danger is “Very High”. Indeed, it’s dry and dusty in the woods. Some people are unsettled by this, as Cliff Mass notes in his weather blog. It should have rained by now, shouldn’t it? Well, this squirrel is not ready to be driven indoors by foul weather. Nor is she ready to seriously pull out the rain gear and boot dryer. It’s time to do those squirrel activities, and enjoy the changing moments of September. Drink deeply of the blue sky, and eat fresh peaches while they last. 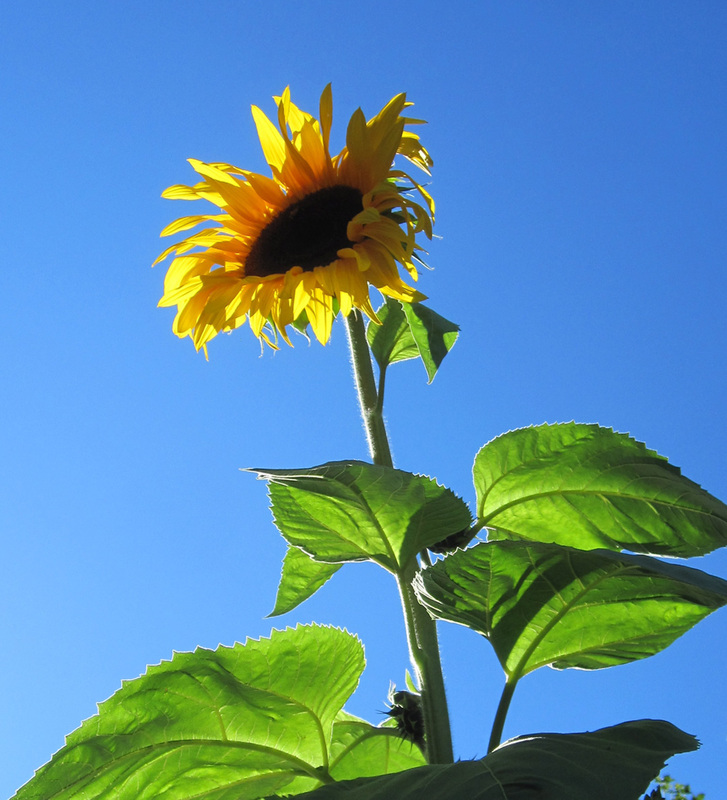 Your sunflower photo is amazing, like all summer in one picture!